Asda is testing a fully automated Wincor Nixdorf checkout in York. The machine – dubbed Rapid Scan – can read barcodes on a conveyor belt using image recognition even if the barcode is placed flat. According to the retailer, items can be scanned in less than one second each – or 100 per minute. 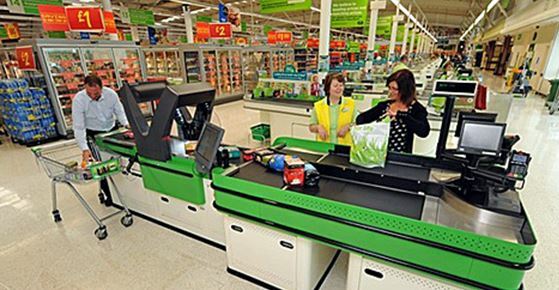 This is three times faster than scanning by hand, Asda says. The Walmart-owned UK retailer’s new solution uses a split conveyor belt, allowing two people to bag shopping simultaneously. Once one shopper’s items have gone through the system to the bagging and payment area, the next can immediately load groceries on to the belt. When each person’s purchases have been scanned, staff push a control button to authorise a chip and PIN card reader to display the bill and take payment. In Europe, retailers such as Rewe Group, Dia and ICA Gruppen have already been testing fully automated scanners since 2011. In the US, Kroger has been piloting its in-house fully-automated tunnel scanner, first developed in 2010. Categories: Convenience retail, Convenience retailing, Point of sale system, Point of sale systems, Retail news, Retail systems, Retail technology | Tags: Asda, Dia, fully automated scanners, groceries, ICA Gruppen, Kroger, Rapid Scan, retailer, Rewe Group, shopper, shopping, Wincor Nixdorf | Permalink.